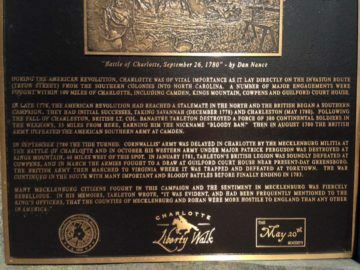 The Battle of Charlotte took place at the Mecklenburg County Court House, which is now the site of the Bank of America tower at Trade and Tryon Streets in downtown Charlotte. An advance guard of Lieutenant General Charles Cornwallis' army rode into town and encountered a well-prepared Patriot militia, under the command of Major William R. Davie, in front of the court house. A skirmish ensued in which George Hanger, leading the British cavalry, was wounded. The small Patriot force, which had not intended more than token resistance, withdrew north toward Salisbury upon the arrival of Cornwallis and the main army. Armies - American Forces was commanded by Col. William Davie and consisted of about 150 Soldiers. British Forces was commanded by Maj. George Hanger and consisted of unknown number of Soldiers. Casualties - American casualties were estimated to 5 killed and 6 wounded. British casualties were estimated to be 44 killed and wounded. Pursuant to the British "southern strategy" for winning the Revolutionary War, British forces had captured Charleston, South Carolina early in 1780, and had driven Continental Army forces from South Carolina. Following his successful routing of a second Continental Army at Camden in August 1780, Cornwallis paused with his army in the Waxhaws region of northern South Carolina. Believing British and Loyalist forces to be in control of Georgia and South Carolina, he decided to turn north and address the threat posed by the Continental Army remnants in North Carolina. In mid-September he began moving north toward Charlotte, North Carolina. Cornwallis' movements were shadowed by militia companies from North and South Carolina. One force under Thomas Sumter stayed back and harassed British and Loyalist outposts in the South Carolina backcountry, while another, led by Davie, maintained fairly close contact with portions of his force as Cornwallis moved northward. 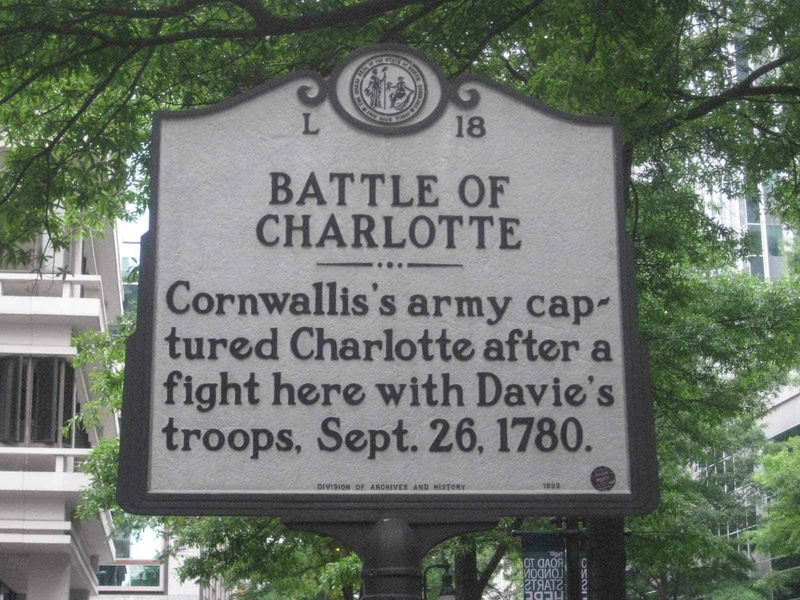 Davie successfully surprised a detachment of Cornwallis' Loyalist forces at Wahab's Plantation on September 20, and then moved on to Charlotte, where he set up an ambush to harass Cornwallis' vanguard. Charlotte was then a small town, with two main roads crossing at the town center, where the Mecklenburg County courthouse dominated the intersection. The southern facade of the courthouse had a series of pillars, between which a stone wall about 3.5 feet high had been constructed to provide an area that served as the local market. Davie positioned three rows of militia at and north of the courthouse, with one behind the stone wall, and placed cavalry companies on the east and west sides of the courthouse, covering the roads leading away in those directions. Finally, he put a company of 20 men behind a house on the southern road, where he was expecting the British advance. As his column approached Charlotte, Cornwallis sent Lieutenant Colonel Banastre Tarleton's subordinate, Major George Hanger to investigate. Cornwallis ordered Hanger to cautiously enter the town and check for militia, which he expected to be in the area. Contrary to Cornwallis' orders, Hanger and his cavalry blithely galloped into town. 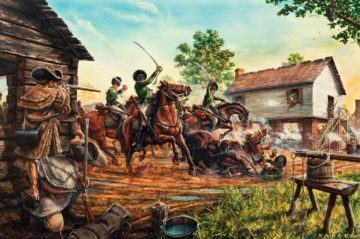 Even after the 20 men behind the house opened fire, Hanger's men continued to ride on until he was met by heavy fire from the line of militia behind the stone wall. When the first militia line maneuvered to make way for the second, Hanger misinterpreted their movement as retreat, and continued the charge. This brought him into a withering crossfire from the second line and the cavalry companies stationed to the east and west. Hanger went down with a wound, and his cavalry retreated in some disarray back to the Legion's infantry. 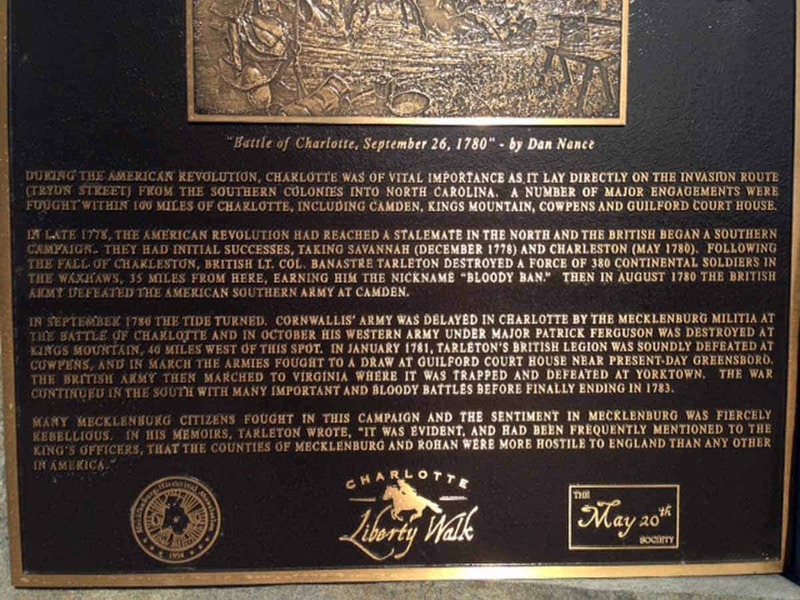 The British followed them with caution for some miles, and discovered the American camp at Charlotte. Hanger sent his light infantry, commanded by Lieutenant Colonel James Webster, forward to clear out the Americans from their positions along the fences by the road. Webster's attack against forced the Americans to leave the fences along the road and fall back to the stone wall. Hanger personnaly led his cavalry against the 20 Continental dragoons. Davie's troops drove the British back in the first assault. Hanger then led a second cavalry charge againt the stone wall and was again stooped and forced back. Cornwallis, alerted by the sound of battle, rode forward to assess the situation. Sarcastically calling out "you have everything to lose, but nothing to gain", he ordered the legion forward once more. By this time, the main army's light infantry had also begun to arrive, and Davie withdrew his forces. Hanger termed the incident "a trifling insignificant skirmish", but it did clearly communicate to Cornwallis that he would have to expect further resistance. Hanger then also fell ill, further disabling the effectiveness of Tarleton's Legion. Instead of advancing on Hillsboro, Cornwallis occupied Charlotte. His position was never entirely secure, because the Patriot militia interfered with any significant attempts to communicate with the countryside. Cornwallis' left flank, commanded by Major Patrick Ferguson, was virtually destroyed in early October at Kings Mountain, and Cornwallis eventually withdrew to Winnsboro, South Carolina in November on reports of persistent Patriot militia activity in South Carolina. 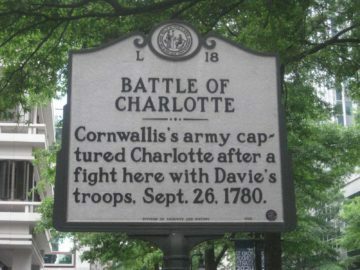 "At the time of approach of Cornwallis to Charlotte, under Colonel Davie the troops posted themselves to meet the enemy. On the enemy's approach the companies commanded by this applicant received the first onset from Tarleton's Cavalry, and the firing became general on the left wing. The troops were commanded by Colonel Davie in person, and for three times we succeeded in repulsing the enemy. At length we had to yield to superior numbers. In this battle we had many men killed, several from under this applicant." “I acknowledge that I was guilty of an error in judgment, in entering the town at all with the cavalry, before I had previously searched it well with infantry, after the precaution Earl Cornwallis had given me. But when I risked so few lives in drawing the fire from the enemy, I trust that, in some measure, palliate the fault. None but the advanced guard were with me till most of the enemy had given their fire. A part of the cavalry in reserve, whether from perceiving the enemy planted behind the houses, and imagining they were impervious to my view, (which they were, until I was considerably advanced into the town), or for other reasons best known to themselves, at this advantageous instant of time did not advance. My intent of charging through the town, after having drawn the enemy's fire, now became too late and too dangerous; and I was happy to draw the cavalry off as quick as I could, and with so trifling a loss. We had a part of the legion infantry mounted on inferior horses, to enable them to march with the cavalry, ready to dismount and support the dragoons. These infantry, of their own accord, very properly had dismounted, and formed before the cavalry were near out of the town. I ordered them to take possession of the houses to the right, which was executed before the light infantry, and the remainder of the legion infantry, came up, who were left behind with Earl Cornwallis to march at the head of his column. I appeal for the truth of this assertion to Captain Campbell, who, as their senior Captain, commanded them, came running up to me, when our dismounted infantry had advanced, and in a most friendly manner intreated me not to impute any blame to him, for not running up with the remainder of the light and legion infantry instantly on the first hearing of the firing; for Earl Cornwallis had ordered him to keep them with his Lordship. At this moment Earl Cornwallis appeared in sight, having been but a very short distance behind with the army, and ordered the whole to halt. The enemy had by this time all quitted the town for the woods and swamps close behind it. The whole light troops now advanced. You will please to recollect, Captain Campbell, whose name I have just mentioned, was not wounded in the town, but above half an hour afterwards, and full one mile further one. It was a trifling insignificant skirmish, which no person but the malevolent Stricturist (happy at all times to detract from public or private honour) would have attempted to have made of such magnitude, or even have ever mentioned.